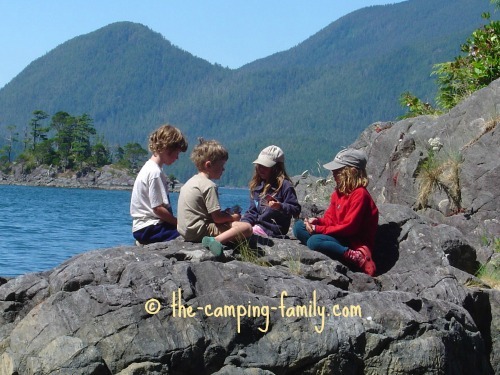 Playing camping games together is one of my favorite things to do on a family camping trip. When we are on vacation, we have the time to have fun together! Playing games lets us reconnect as a family. We can learn new skills, enjoy some friendly competition, and be silly together. You might be tempted to pack the iPad, just in case the kids get bored. Don't do it! Spending time away from the phone, the TV and the computer is the perfect opportunity for everyone to remember how to play! There are so many great camping games that you really don't have to resort to using electronics. What makes a good camping game? • It gets everyone involved. • It is fun for all ages. • It has fairly simple rules. 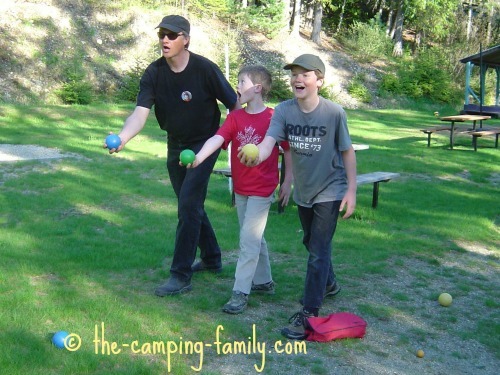 Here are some fun games to play on your next family camping trip. 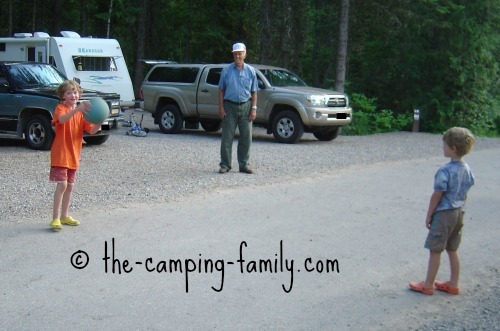 Visit any busy campground and peek into the campsites. Chances are that you'll see at least a couple of these popular campsite games. These are all variations on the same theme: "throw something at a target". They are all easy to play, suitable for all ages, and lots of fun! 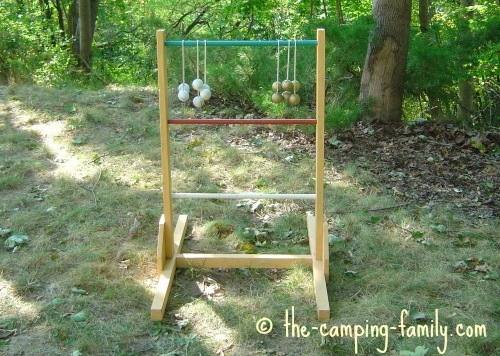 Click here for more information on these games for camping. You don't have to have special equipment in order to have fun playing together! Remember the games of your childhood? They are still fun - especially when you play them together with your family! All you need for these games is an open space, a group of people, and a willingness to have fun. If you're feeling especially ambitious, organize a scavenger hunt! Here are some scavenger hunt list ideas to get you started. Pack up a couple of pieces of sports equipment and organize an informal game. Would you believe that I always hope for at least one rainy day on a camping trip? It's true! I love sitting in the trailer, or under a tarp, drinking hot chocolate and playing board games! Click here to see more of our favorite board games to play while camping. Playing games in the dark is exciting! 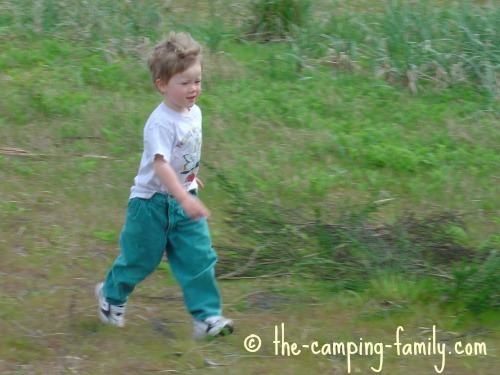 Click here to learn how to play flashlight tag and more nighttime games. Don't organize every minute of your camping day. Make sure that your kids have lots of unstructured time so that they can make their own fun. 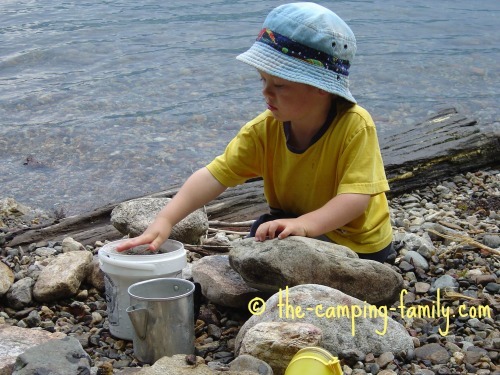 Here are some fun camping ideas to spark their imaginations. 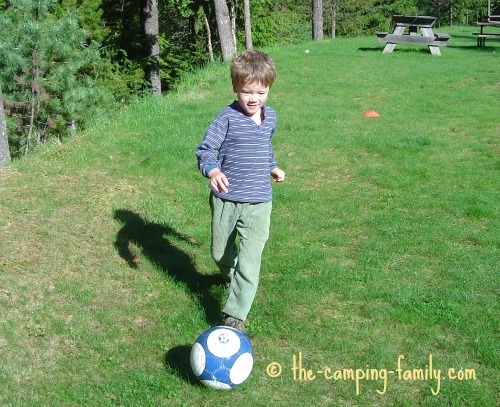 Have fun playing together on your next family camping trip! 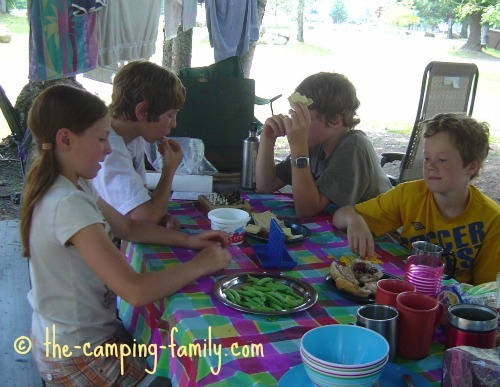 Now that you have lots of great camping games in mind, visit The Camping Family home page for more camping ideas.